Book a 7 day vacation package to New Zealand and get a free 2 night stopover on the Cook Islands at the Muri Beach Club located on the stunning Muri Lagoon among tropical landscaped gardens. Onto New Zealand and experience the romance of the south island with a 7 day journey from Queenstown along the remote west coast before traversing the Southern Alps by train to Christchurch. Retreat, relax and revive in chic sophistication on Rarotonga's best swimming beach, where the only distraction is the location! 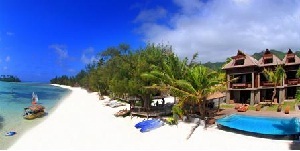 The Muri Beach Club Hotel enjoys an enviable location on the very best stretch of beach on Muri Lagoon. Beachfront rooms have stunning views over the lagoon and the small offshore islands (motu). This perfect getaway retreat is privately owned and operated with relaxation, privacy and guest satisfaction as its mission objective. Boutique in style and service, the Muri Beach Club Hotel welcomes you to experience the real rhythm of Rarotonga.... in absolute chic sophistication. During your Funyaks full day experience you will experience NZ's most scenic jetboating experience and then float down river in their own inflatable kayak allowing plenty of time to explore the rivers hidden secrets. Enjoy a wilderness buffet lunch and exceptional guide interaction on this premium product. Funyaks is more suited towards visitors who are looking for a unique eco-experience - guests must have average fitness. Overnight on the Milford Mariner, a 40 metre motor vessel, leisurely cruise Milford Sound, explore points of interest and view the spectacular alpine scenery and keep a lookout for wildlife including seals, dolphins and penguins when in season. After reaching the open sea the sails may be hoisted, anchors overnight in sheltered Harrison Cove. The shortest route to Wanaka is over the Crown Range Road. It's a challenging drive, but the views are amazing and you'll probably encounter friendly keas (mountain parrots). More conservative drivers can take the route that runs beside the Shotover River, Lake Dunstan and the Clutha River. The vineyards of the Gibbston area and bungy jumpers at the Kawarau River Bridge are interesting distractions along the way.The lakeside resort town of Wanaka can provide you with an appealing mix of fine living, family fun and adventure. It has a high concentration of cafes, restaurants and interesting shops. You'll also find some unique attractions, like the 3D maze and the warbird air show, which is held every two years. Lake Hawea is the first scenic highlight of your journey, followed closely by the northern end of Lake Wanaka. The famous "bra fence" is impossible to miss, it started as a joke, but it's become a local legend. At the wilderness town of Makarora you can fuel up and refresh before you take on the dramatic twists and turns of the Haast Pass. Enjoy waterfalls and river scenery as you arrive in rainforest country. The settlement of Haast was once a construction camp for the Ministry of Works (the government department responsible for road and bridge building). It's a town with a touch of the wild west, helicopters fly deer hunters into the rugged ranges and local pubs make a feature of stuffed animal trophies. Just north of Haast is Lake Moeraki, a peaceful forest lake with good fishing, a 40 minute walk takes you to the penguin colony at Monro Beach. Next is pretty Lake Paringa, where you can enjoy a delicious meal of salmon at the salmon farm. Just before Fox Glacier is the western end of the Copland track. In half a day you can walk to the hot springs at Welcome Flat. The terminal face of Fox Glacier is just 5 kilometres from the township that serves it. The road to the walking track crosses ancient moraine from earlier advances and retreats. Fox Glacier was named after an early New Zealand Prime Minister, William Fox. The Fox and Franz Josef Glaciers are unique relics of the last ice age. Mighty rivers of solid white, tumbling down ice-hewn rock valleys, they are classically beautiful in the glacial sense. Nowhere else in the world have glaciers advanced so close to the sea at this latitude. While in the area, you can choose from a wide range of adventure activities. After a short drive north, you'll arrive at Franz Josef Glacier. First explored in 1865, the glacier has been moving forward at a rate of about 1 metre a day since 1985. Previously it was in retreat. You can walk to the terminal of the glacier in about 10 minutes. Franz Josef township has a good range of accommodation and eating establishments. Your guide stops to explain the unique features of the Franz Josef Glacier and its surroundings. After strapping on crampons you make your way up the terminal face of the glacier, where pre-formed tracks make exploring the lower reaches of the glacier achievable for most agile people. For the most adventurous, the full day hike takes you further into the heart of the glacier. The road from the glaciers is rural, but with a wild streak. The farmland is trying to turn back into forest, and the beauty of the rivers is raw and primeval. At Ross thereâ€™s a goldfield walkway to explore, or enjoy a picnic by the shores of Lake Ianthe. A visit to the White Heron colony near Whataroa is a rare experience. Hokitika was first settled in 1860, after the discovery of gold on the west coast. It still has the feel of a frontier town, and there are some lovely old buildings to admire. Greenstone (NZ jade) is the town's treasure these days, watch it being carved. You might also want to investigate the museum and do the historical walk. The road between Hokitika and Greymouth provides great views of the wild west coast. Detour to the beach and breathe the salt spray air. Driftwood is the ornamentation of choice for west coast beaches every shape, size and colour. Shantytown, just south of Greymouth, is a reconstructed 1880s gold rush town and great family entertainment. Greymouth has a long gold mining history. It's the largest town on the west coast and is known for its awesome seascapes. The local brewery runs tours or you can catch up with west coast history at the museum. White water rafting, sea kayaking and gold panning are other things to do. Arrive Greymouth no later than 1pm, return rental vehicle and report for the Tranz Alpine train departure at 145pm. Departing through lush beech rain forest, your train then climbs into the Southern Alps, before descending into the spectacular gorges and river valleys of the Waimakariri River. From your carriage you’ll see the fields of the Canterbury Plains and farmland. All carriages include both one way seating and tabled group seating allowing you to experience the amazing views while enjoying the company of other passengers on-board. An open air viewing carriage allows you to get even closer to the stunning scenery and provides many opportunities to photograph your favourite spots. There’s a lot to look forward to! Our train journey sets off from Christchurch - New Zealand's largest city on the South Island. The trip is 223.8 kilometres long and takes just four and a half hours. There are 16 tunnels, and 5 viaducts, the highest being the Staircase standing at 73 metres. Make your own way to Christchurch airport and flights to US. Te Vakaroa Villas, Rarotonga, Cook Islands. Absolute beach front set right on Muri Beach, Te Vakaroa Villas is a remarkable gated haven, offering unsurpassed views of the remarkable Muri Lagoon and beyond the reef to the South Pacific Ocean. The contemporary designs of the six villas are sympathetic to the natural surroundings, complete with floor-to-ceiling sliders that open onto a large private patio over looking their Infinity pool and Jacuzzi – the ideal places to unwind and enjoy a tropical cocktail. A short stroll along the beach gives access to some of the island’s renowned restaurants. Guests can enjoy a fully hosted holiday or choose to be full self-catering each villa has a beautiful fully appointed kitchen. Muri Lagoon is a water playground for snorkelling, kayaking, kite surfing and swimming. Kayaks and snorkelling equipment for those who want to pull themselves away from their luxurious villa to explore the attractions of the lagoon. Valid for departures until 31 Mar 2014. Prices are per person based on double occupancy for departures from Los Angeles based on low season. Add-on fares available from other cities. Seats are limited and may not be available on every flight. Hotels subject to availability. Hotels subject to availability. All prices reflect a 3% discount for purchases made by cash/check. There are no discounts for payment made by credit cards. Cancellation penalties and other restrictions apply.